Electronic Arts has good news for gamers who are tired of personal glory, fame, and sole-access to the victory money. 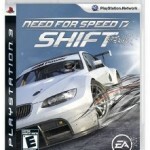 This December, a new Team Racing Mode content pack for Need for Speed: Shift drops on the Xbox 360 and PlayStation 3. The downloadable content pack is completely free, which should make it easier to share the racing spoils. In the new Team Mode, two teams of six race against each other in a blistering online grudge match. Racers must join together and drive like members of a unit to defeat the opposing team. Those who studied Emilio Estevez’s coaching in The Mighty Ducks should have no problem with this concept. Let me know how well the Flying V translates to race car driving. The Need for Speed SHIFT content pack hits Xbox 360 consoles worldwide on December 1st, the PlayStation 3 on December 3rd in Europe, and the PlayStation 3 on December 10th in North America. There’s no word on why Europeons get the content pack seven days before Americans. Don’t us Americans have a bunch of national holidays devoted to racing? Is Columbus Day one? I hear that guy could cruise.